Back at the beginning of 2012 I played around with some Python ctypes as part of a project I was working on in the background. At the time I released a few code snippets that used ctypes to do a few fun things, but never really got around to releasing the main project I was working on. The main project I was working on was a simple Python script that injects shellcode into a running process using CreateRemoteThread (nothing brand new here). The interesting part of the project (for me anyway) was the ability for the Python script to request the shellcode to inject using DNS TXT requests, ICMP request/responses or simple HTTP(S) request (using SSPI if required). I demo’d the code at the BSides London conference in 2012 at the underground / lightning talks an had some positive feedback, however the time just hasn’t been there to finish things off since then. As a result of the lack of time to finish things off, I’ve put up the latest modular version of PySC (version 0.8) on Github for people to use, tear apart , and generally laugh at as you see fit. As the project is still in prototype your mileage may vary. PySC was designed to be configured using the config.py file present in /config directory, and run headless on a Windows system after being packed into an executable using something like PyInstaller. However you can run it using command line options as well by running it with -h to see the various options. The /optional directory also includes some example server-side implementations for Metasploit and a Python Scapy ICMP listener for delivering Shellcode to the PySC client. falls back to injecting into the current process. hard-coded values within the script. Yeah I know, this is turning into a Python blog, and not a very good one at that. Still, hang in there, because all these handy little scripts will make sense soon. Yes, there’s method in the madness! For those who missed the earlier posts, you can view info on IcmpSendEcho, InternetConnectedState and WinInet (SSPI). 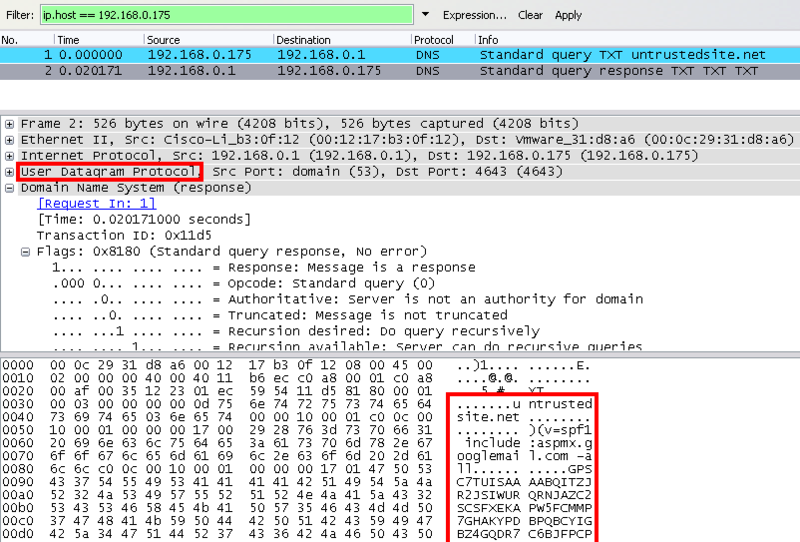 So we’ve covered some interesting stuff, but one thing was still bugging me… Thanks to a pointer by Didier Stevens (literally, it was a pointer issue), I managed to get a simple DnsQuery script running to gather and display DNS Text records. Again, the script is a little large to post on the blog in its entirity, but I’ve included the dnsapi.DnsQuery_A function below for those searching for that specific function. There’s a lot more to getting this running than just the below code, but for the full info you can download the example source (dnstxt.py) below. As with the other examples I’ve created a small (and narrowly focused) tool to retrieve DNS Text records and display them on the screen. It’s a simple script, that takes a dns name, and has options to restrict the request to UDP or TCP only if desired. It’s interesting to use UDP only to test of Text records are too large, and need TCP. Feel free to check it out on c22.cc (which is too large for UDP). Those who’ve done any work with Python will know that there’s a few modules that you can download and install to handle DNS requests of various types. Modules like PyDNS and dnspython are going to give you more flexibility for most things. Unless you really need (or want) to go the ctypes route of course)… yes, I’m a sucker for punishment! As a followup to my simpleicmp ctypes post, I thought I’d post something about the wininet InternetGetConnectedState function for checking if the network connection is up. Obviously you can go through the process of sending an icmp echo request and checking if there’s a response, but this is a lot simpler and cleaner (also less prone to issues if echo request are blocked, or the host just doesn’t respond to them). There may also be situations where your script is trying to be as quiet as possible on the network, and firing off random packets to see if the network is up is bad form. Here’s a simple script that will tell you if the network connection is up or not. 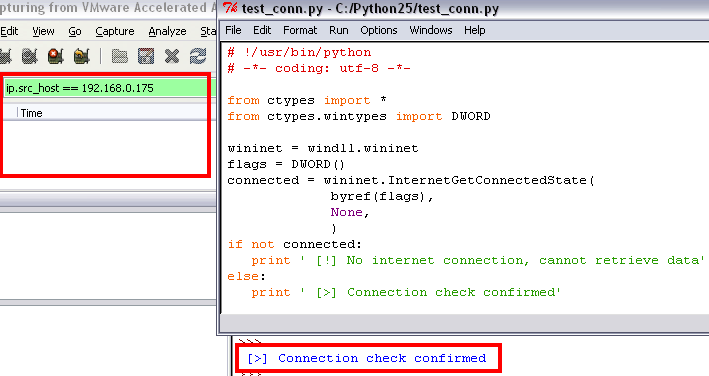 As you can see, this method checks the connection of the network by checking the status of the network port and not by sending anything across the wire.